Postpartum hair loss usually develops within 3-6 months after giving birth and causes excessive shedding. While some women experience more of an overall thinning of the hair, others start to see their precious locks falling out in shockingly large clumps. The good news is, it’s only temporary and the hair will grow back eventually. However, that doesn’t make it easier to deal with when you’re seeing bald spots appear on the scalp. The hair can continue to gradually fall out over a period of 6 months. That’s when it should start to get back to normal. Like many nasty side effects, postpartum hair loss is caused by hormonal changes within the body. During pregnancy, your estrogen levels increase dramatically, pushing more hair than usual into its resting phase. This is when you’re given a false sense of security as your hair looks healthier and thicker than ever before. The trouble is, once you’ve given birth, your hormone levels return to normal. When this happens, it causes the hair which was happily resting, to start shedding. You’ll notice large clumps falling out, which can be a real shock. You’re basically losing all of the hair in one go, that you would have normally lost gradually. As the hair loss is down to hormonal changes, it’s not something which can be prevented. However, it is something you can prepare for. By taking certain measures, you can minimise the shedding and prevent it from getting worse. There’s also a few ways the condition can be treated until it starts to get naturally better. For now, let’s look at the ways you can minimize the hair loss experienced. The American Pregnancy Association states eating a nutritious diet packed full of fruits and vegetables can help. They also suggest ensuring your diet is packed full of protein. It’s common for new moms to diet and incorporate a stricter eating regime in order to try and lose some of their baby weight. However, this could potentially make postpartum hair loss worse, so it’s best to focus on eating a healthy, balanced diet rather than a restrictive one. You can also avoid wearing your hair in tight hairstyles. As the hair is already falling out and it becomes weaker for a while after the birth, tight-fitting hairstyles are going to cause damage to the hair. This in turn will lead to further hair loss. These are the main two ways to prevent the condition from worsening, but what about actual treatments? Many experts argue you cannot treat postpartum hair loss – it’s simply a waiting game until the hair starts to go back to its normal cycle. However, while there are no concrete treatments out there, you can still treat the condition to minimize its effects. Here we’ll look at some of the best ways to deal with postpartum hair loss. Consider Having A Haircut – Have you noticed many new moms often switch to a shorter hairstyle? One of the main reasons why is, you guessed it, postpartum hair loss! Shorter styles make the hair appear thicker and healthier. So, if you’re experiencing thinning, treating yourself to a shorter cut could be exactly what you need to regain that confidence; not to mention the fact it’s easier to maintain. Try Out Topical Medications – While many topical treatments for postpartum hair loss are largely just a gimmick, there are some which have proven to be effective. Minoxidil, or Rogaine as it is often called, is one of the best hair loss topical treatments you can find. It’s typically available over the counter at local drugstores (or available online,) but you may need a prescription for a higher strength variation depending upon how severe the hair loss is. While this type of topical treatment isn’t suitable for long-term hair loss conditions, it’s perfect for those suffering from temporary hair loss. Simply rub it on the scalp as directed and it will help minimize the hair loss and encourage quicker regrowth. Try A Light Volumizing Mousse – It’s important not to clog the hair up with heavy products, but a light volumizing mousse can help provide an illusion of thicker, healthier hair. It will also help to keep the hair nice and moist. Avoid using leave-in conditioners too. Some sites tell you leave-in conditioners can help keep the hair looking healthier, but in reality, they tend to weigh the hair down, highlighting the hair loss rather than covering it up. Overall, postpartum hair loss can be distressing, but it is completely normal. While the above tips can help you to manage the condition, the main thing to remember is that it’s only temporary. You’re not going to be stuck with constantly thinning and balding hair and postpartum hair loss rarely leaves total bald spots. So, stay calm, treat yourself to a haircut and remind yourself you’ll soon have your thick, healthy hair back in no time. 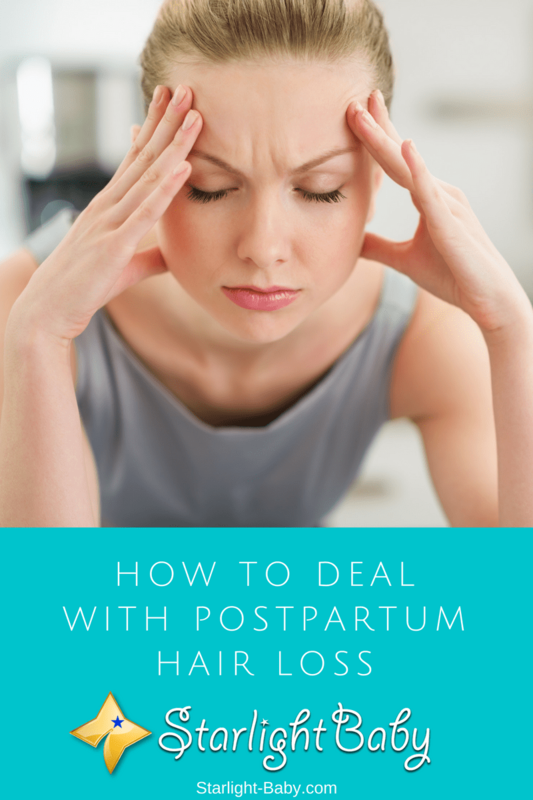 This is the first time I’m hearing about postpartum hair loss! Thanks for shedding light on a seldom discussed part of pregnancy. I like the idea of cutting hair short and using a volumizing product. It seems like it would both make the hair appear thicker and be easier to manage. Fortunately for me, I didn’t experience postpartum hair loss. Probably because I maintained my hair short. I know someone who has a very thin hair, almost bald actually. I never had the guts to ask her why her hair is that way though so I don’t know if it’s also due to postpartum hair loss. Pregnancy is never an easy task, to conceive and carry a baby for 9 long months, with the pains of labor staring you at the face at the time of delivery, it’s never easy for them. Just like you already pointed out in the article about the changes and effects pregnant mothers pass through in and after pregnancy, with swollen ankles, morning sickness and heartburn etc. But the issue of hair loss caps it all as it comes 3-6 months after giving birth. Thank goodness it’s not permanent but only on temporal basis, and there are ways to prevent it from getting worse. It’s definitely a great sign of relief for all pregnant mothers. I would definitely make sure to pass this information across to any pregnant women that I happen to be in close relationship with, as I believe it would be very useful to her when her own hair starts to fall off. You’re right, Martinsx, “pregnancy is never an easy task.” I do think hair loss would be the most difficult effect women have to contend with after giving birth. Thank God it’s not permanent. My relative was pregnant with a baby about a year ago. It’s weird seeing her shed hair strands here and there a few months after giving birth. This sort of condition is actually new to me. I wasn’t very aware of it until I found this post. I would notice some moms losing hair after giving birth but I didn’t know it was actually part of the process. I’m inspired to support my loved ones experiencing this part of post pregnancy. Instead of feeling self-conscious, I’ll help them feel confident no matter the circumstance. Thank you for understanding this type of problem, Steve5. A problem like this can be really depressing for women, so support and understanding are what they need. My wife experienced this and she was shocked and nervous at the same time. She even kept on asking women, in her and my immediate family, who already gave birth if what is happening to her had happened to them. And they all said yes, and it’s completely normal. That, somehow, eased her but not completely. Our daughter is already 11 years old and she told me recently that she still experiences these hair fall but not as heavy as during those first 6 months. @fern2x2001, during these times when your wife’s hair is still falling out, has she been under a lot of stress? That might explain why it still happens from time to time. I know I’ve experienced stress based hair loss. At one point it was so bad I thought I was losing my hair for good and started visiting a dermatologist. Well, before i posted that comment of mine, i asked her if she still experiences this hair loss related to her giving birth. And she replied, “Yes, but not as much during the first six months after giving birth.” But now, her hair is gradually growing and thickening. So we really attribute her hair loss because of her giving birth. Do you still experience hair loss up to now?! Hair loss is a really shocking problem. A woman experiencing this can begin to think of the worst possible scenarios. It’s a good thing your wife asked members of the family. Knowing you’re not alone in your struggle is comforting, although one can never really feel fully relaxed about it. Have her see a doctor so she’ll know what to do. The haircut is true. I have seen most women having a haircut after giving birth but I never knew it was because of hair loss that resulted after giving birth. My mum had a haircut too. I might also consider using this option. 😀 Thank you for this educative post. Three months after I gave birth to my first child, I did notice that my hair started to fall out. Now that my daughter is already nine months old, I am still dealing with the same hair problem. I am fine with my hair falling out but I can’t take these little baby hair strands growing on my head. It looks just awful. Ah, that is quite inconvenient indeed when your daughter pulls your hair. A shorter hair may work and do good for you 🙂 A new hairstyle would be a welcome thing. It will grow long again anyway if you really want to wear it long. I did have this after I gave birth to my son and what I did is cut my hair short for my hair to recuperate. Although it’s stressful to deal with, especially because I’m Asian and Asians have thicker hair strands. So when your hair sheds, and it is a lot, and immediately noticeable, I tried not to focus on that and keep myself from stressing about it too much. Also, I did equip my body of the nutrients that I still do when I was still pregnant. So that my body can adjust and I can keep up also with the breast feeding. Good job, AmieBotella for handling the situation positively. You’re right, stressing about hair loss would only stress you more so it’s best to address the problem instead 🙂 Thank you for sharing your experience and how you handled it. This sort of hair loss is short-term, but for guys, it seems to be permanent. I’m wondering why there is a difference. However, though, in recent years, there has been breakthrus in hair-loss treatment, but ironically a lot of men are not just going totally bald anyway, seeing as it’s not unfashionable now. But for women, of course, baldness has always been weird and undesirable. Yes, Jason76, baldness in women is “weird and undesirable” that is why women who suffer from it after giving birth freak out or become agitated by the condition. Thank goodness it is a temporary thing. For men, it’s a different story, and baldness does happen. But as you’ve said, there are hair loss treatments available now so that’s a relief. It’s nice to learn about the postpartum hair loss in nursing and pregnant mothers. One interesting aspect of that is the way you took out to explain how it can be managed simply by having a low cut hair during those periods. Reading this will give me the courage to convince my fiance, if she delivers not to worry if there is any hair loss in her. Oh yes, Henrywrites. Do tell your fiance’ not to worry about it in the future. Besides, not everyone suffers from it. Hopefully, she doesn’t. Have her read the article as well so she will get a better perspective like you. I asked my wife if she used anything to do something about her hair loss. She said, “Nothing! Because you can do nothing about it.” She also said that she just waited it out until the hair loss gradually stopped and her hair gradually grew back again. During those times when she was loosing hair, she was really stressed about it. Asking me couple of times a day if it’s really okay. What i did was just to ensure her every time that it was okay and natural to loose hair after giving birth. I believe this is one role of husbands to keep ensuring the wives that everything is alright to keep them from being stressed out from everything. Yes, reassuring your wife that everything will eventually be alright is a wonderful step towards supporting her emotionally and psychologically. I’m sure that’s what she badly needed to hear, most women do. It’s a stage when women are most prone to depression and the best cure are supportive and kind words from the husbands. Good job, fern2x2001! Oil massage helps in controlling post-partum hair loss. I tell this from my wife’s experience. Give your hair warm oil massage every day, it will not only soothes your mind but also makes your hair root strong. Another way is to take folic acid. During the pregnancy, the expectant mothers should take folic acid for the development of the fetus, however, taking folic acid post-partum helps to control hair loss. Thank you, vinaya, for the wonderful suggestions. I have heard of other women who have also used warm oil on their hair and they say it works, especially if it’s coconut oil. And you’re right about folic acid, too. Experts say the lack of folic acid could also cause hair loss. Other reason of hair loss is because of too much use of hair wax, hair gel, hair color, hair spray, and shampoo. Yes too much use of shampoo can make your hair dry and unhealthy. Try not to use shampoo at least 3 times a week. Let the natural oil of your hair clean your hair. The last possible reason of hair fall that I know is that you are stressed, when you are stressed it is possible for you to grow white hairs or you will have hair fall. If your hair fall continues and you think it is not normal any more, it’s time for you to consult to a doctor.